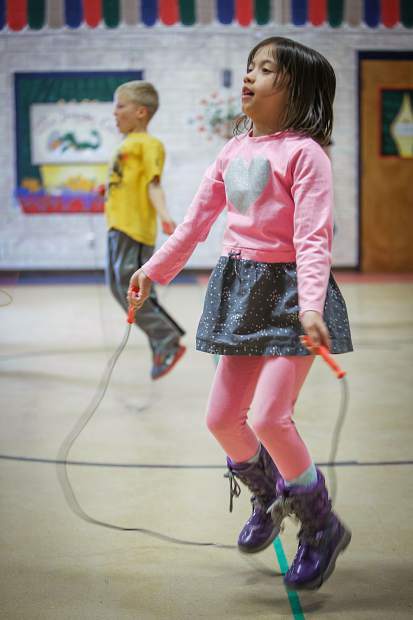 Children in the CATCH After school program jumping rope. Rob Katz, the CEO of Vail Resorts, and his wife Elana Amsterdam recently donated $250,000 to The Summit Foundation. The grant will go toward the CATCH Afterschool program as well as Mountain Futures Center. On April 14, Vail Resorts announced that Rob Katz, CEO of the company, and his wife, Elana Amsterdam, had donated $1.6 million to community nonprofits. A portion of the donation was given to The Summit Foundation, which received $250,000. The couple’s donation was focused on programs that support children and families across the communities where Vail Resorts operates. Last January the couple donated $1.5 million to the EpicPromise Foundation, which gives emergency relief to Vail Resort employees. “The welfare of children and families in our local communities who are most vulnerable requires our attention and we feel fortunate to be able to support some outstanding nonprofit organizations who work tirelessly to serve them,” Katz said in a release from the resort. The Summit Foundation distributed the grant between two programs in the county: CATCH Afterschool and the newly formed Mountain Futures Center. Coordinated Approach to Children’s Health, or CATCH, helps to serve 250 children across the county over the year. The program is a partnership between the Keystone Science School, the Family and Intercultural Resource Center, the Summit County School District as well as The Summit Foundation. “It kind of came together a few years ago because there wasn’t any quality after-school programs for kids,” said Jeanne Bistranin, executive director of The Summit Foundation. The program is run out of the Keystone Science School and has three 12-week sessions per school year. This year, the funding FIRC received from the Colorado Health Foundation changed. The organization was using the money they received from the Colorado Health Foundation to fund CATCH. Both the foundation and FIRC changed some of the requirements for funding, which caused a shortfall in the budget for the after-school program. Lizzie Meyer, the community programs director at the Keystone Science School said that the funding they originally received from the two organizations was cut in half. “The Colorado Health Foundation still has a grant for out-of-school activity, which still falls in line with the CATCH curriculum and what we do, and the FIRC is still a partner, just at a reduced amount,” Meyer said. The grant from Katz and Amsterdam will help the program run for another two years. Meyer said that funding is crucial to the program because it allows CATCH to have a sliding pay scale for parents who may not be able to afford the full price of after-school care for their children. Around 60 percent of the students in CATCH qualify for free and reduced lunch. Julie McCluskie, the director of communications for the Summit County School District, said that the Mountain Futures Center is still in its development stages. The program is built to help Summit County students with their education after high school. Bistranin said that the county has worked to help increase high school completion rates for at risk populations within Summit. The next step for them was to help student with college completion. Mountain Futures is a pilot program in conjunction with Colorado Mountain College that they are looking to expand. Their goal is to find affordable paths through college for individual students. “A lot of scholarships are for freshman and sophomore year, so we need to look at the whole picture to say, you know, ‘How can we make sure that kids with financial need have enough money to go all four years and graduate?’” said Bistranin. She added that the program will not be just for low income families, but for all families putting a child through college. The center will be a resource for both students and families looking for more information on the financial process of college. She added that a key aspect of the grant given by Katz and Amsterdam is that it will support students of all ages throughout Summit. “The grant that (Katz) gave us will serve elementary kids, middle school and high school,” she said.